'Sorry,' and it wasn't a DDOS, says Facebook. 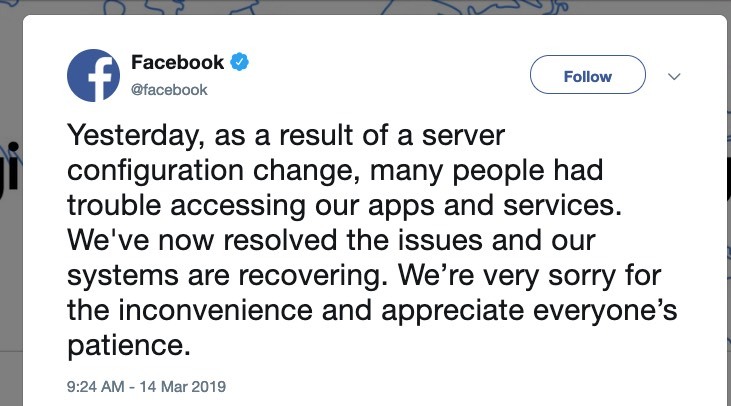 Facebook says all of its apps and internet services, including Instagram and WhatsApp, are again operational after an extended outage on Wednesday. All three services went down at the same time, as did services for Oculus Rift. Facebook execs attribute the downtime to a “server configuration change.” Seems legit. The interruption also affected gameplay for owners of Oculus VR headsets, a company Facebook bought in 2014. Some sites, like Tinder or Spotify, that use Facebook credentials were unable to authorize logins. Workplace, Facebook’s connectivity platform for companies, also suffered issues. In 2008, Facebook was knocked offline by a bug that affected many of its 80 million users. That outage lasted for about a day. Facebook now boasts about 2.3 billion monthly users, making the recent outage the worst yet for the company, and its family of apps and services. During the outage, Facebook’s developer dashboard reported an uptick in the Average API Error Rate. The company did say that it was not caused by a distributed denial-of-service (DDoS) attack. The November 20th, 2018 outage affecting Facebook and Instagram was caused by a “bug in our server,” the company said at the time. With Facebook unreachable for many, its properties were left with little choice but to communicate status of the outages on that other social network: Twitter. Proving yet again that Twitter is the place where the people who write the news get their news. With Facebook and Instagram down, Borders and Barnes and Noble have just reopened all their stores. Not an exact science, but analysts expect Facebook to generate $68.93 billion in revenue this year. That's an average of $188.8 million a day. Outages are expensive.